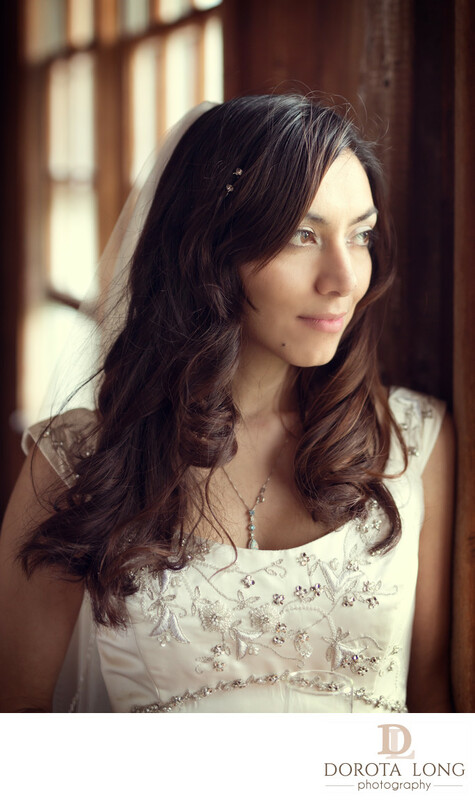 I took this image last year when I was photographing this bride's small wedding in Candlelight Farms Inn in New Milford. The wedding was very intimate and only closest family and friends were present. The wedding couple got married in a short outdoor ceremony and then we all went to the small building where the reception was supposed to take place. We took some great shots there. I love how rustic it was and I thought the place had great potential for pictures. Right away I noticed huge windows on two opposite sides and I thought the light was perfect. I was prepared and had off camera flash, which I ended up using. The grooms mother asked if they could have a quick family photo taken there. I had a flash on my camera and using a TTL mode I enabled it to bounce the light off of the white ceiling, back onto the guests. I really like the result. The place had pretty good light quality but when I had about 20 family members to photograph, I had to raise my aperture which meant I was losing light at that point. In order to add more light, I used the flash. For this image, I asked the bride to look out of the window. I took picture of her while she was doing so and I loved the rustic surroundings but also pearl details on her dress. She had beautiful brown hair and was beautiful.